Game, set, and match to the Statists and the big labor agenda. From this point forward, the government will be deciding what cars are made, and the unions will literally be negotiating with themselves to determine how much theyll earn making them. 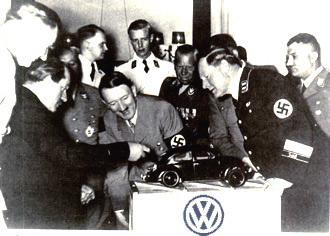 The government was able to buy it's way into total control of the auto industry for only a few billion dollars. A tremendous day for Statism, a dark day indeed for the free market and for individual liberty. DETROIT  General Motors Corp. could be majority owned by the federal government under a massive restructuring plan laid out Monday that will cut 21,000 U.S. factory jobs by next year and phase out the storied Pontiac brand. If both are successful, the government and UAW health care trust would own 89 percent of GM stock, with the government holding more than a 50 percent stake, CEO Fritz Henderson said in a news conference at GMs Detroit headquarters. Henderson said that although the government would own a majority of GMs outstanding common shares, the Treasury hasnt demonstrated interest in running the company, but would have someone on the board looking out for the taxpayers interest. The task force has directed current board chairman Kent Kresa to replace several board members. This is about as blatant of a case of simultaneously talking out of both sides of one's mouth as there is. The government has no interest in running GM; they just want to be able to fire the company's GM and have the power to decide who is on the board of directors. You've got to give the Obama administration points for sheer chutzpah. And millions of political cuckolds are literally choosing to believe him rather than trusting their own lying eyes. There's a story entitled, "The Devil and Daniel Webster" that describes what can happen when one foolishly makes a deal with the devil. Unfortunately, the Jabez Stone stand-in (GM) won't have any Daniel Websters to confound Mr Scratch (brilliantly depicted by Barrack Hussein). The lesson of this story is that it's bad enough to do a deal with the devil; but never, NEVER, NEVER do a deal with the government. You can't win, and you won't even be able to lose with dignity. The shareholders, the VEBA (health care trust) and the government would want to have a someone on the board of directors, he said. The struggling automaker said it will offer 225 shares of common stock for every $1,000 in notes held by bondholders as part of a debt-for-equity swap. Henderson said the objective is to reduce GMs $27 billion of outstanding public debt by about $24 billion. The company estimates that after the exchange, bondholders would own 10 percent of the company. The plans, if successful, would reduce GMs debt by $44 billion from the present figure of about $62.4 billion. We would be substantially less-leveraged as a company, Henderson said. The same government that couldn't run a cafeteria without going millions of dollars into the red; the same government that still can't run a successful post office in spite of the numerous successful businesses that have sprung up all around it; the same government whose model for successful customer service is the Department of Motor Vehicles, is going to be teaming up with the very unions who ran the auto manufacturing industry out of business in the first place to build cars. The auto industry today; the oil industry tomorrow. We don't need oil anyway. Just ask Senate Majority Leader Harry Reid: It's devil-juice, for sure. I wrote an article around a youtube video entitled, "The Car That Will Save The Auto Industry (And The Planet!)." It's not a joke any more, given that we elected a bunch of totalitarian Statists to run our country. Ever heard of the Soviet government-produced Lada? You haven't? Don't worry; you'll be getting a chance to own its American equivalent in just a few years. Give the whole damn thing to the unions. Let them experience their own unreasonable demands. Gee, what was that other government run car company? Nice deal. The UAW contributes greatly to the destruction of GM. And as payback for some campaign contributions winds up having payback = given the company. Very scary. It will be the first time in history that a union will make the initiative to suggest wage cuts. Otherwise they won’t survive and unlike the Soviet made junkers this company will have real world competition to deal with and competition creates quality. Isn’t that ironic? Don’t you think? The company that made my beloved Corvette, is dead to me. The UAW contributes greatly to the destruction of GM. And as payback for some campaign contributions winds up having payback = given the company. Very scary. What the heck? Why not hand them the keys to the factories and walk away? Then - they can reap what they sow. Obviously the bondholders will insist on a bankruptcy filing, after which they will own GM, or its remains. What are these clowns in DC thinking? What an interesting case study for future studies? So what? Do they own the market? Do they think anyone will ever buy another GM vehicle if it is owned by the Gov and the UAW? I would never buy a GM product again. Period!